You will find two free Airplane Tracker tools available here for your use. Both of these tools are quite advanced and are capable of tracking over 50,000 flights each and every day worldwide. When you have a loved one traveling on a flight either home or abroad, you can now watch their flight as it departs and arrives at it's point of destination. Come and we will show you how easy these plane tracker tolls are to use. The very first thing we need to do is locate the first flight tracking tool. You are going to need the Airline and the flight number of the particular flight you are wanting to track. Click here to open Flight Aware. See all those red dots over America? That's right, that's some of the airplane flights that can be tracked. Amazing right? Now just to the left of that map is an area called "Flight Tracker". Just below that is where you enter the Airline and Flight Number of the particular flight you are wanting tracked. Congratulations you are now tracking the flight of your loved one. Great isn't it? This second airplane tracking tool is my absolute favorite. When you are able to combine a flight tracking tool with Google Earth you have right before you an ingenious tool. Not only are you able to track any flight as you did before, you are also able to see different views around the airplane and you can actually arrive at the destination well before the flight. Check out the current weather and temperature, see the sights and a whole lot more. Before we can take advantage of this fantastic plane tracker tool, you are going to have to download Google Earth onto your desktop. Now allow me to direct you to fboweb. Just as you did with Flight Aware enter the airplane information i.e. the airline company and the flight number where you see "Track a Specific Flight". All that you need do now is Bookmark this page so that you can use these tools whenever you want to in the future. 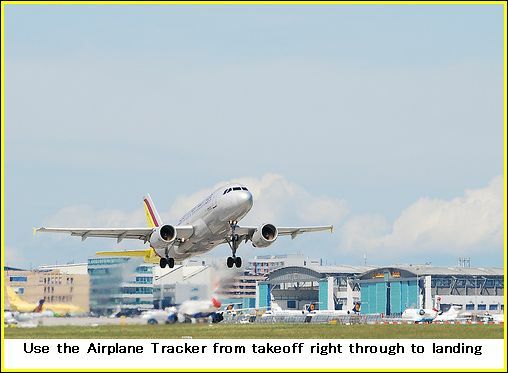 Do you need assistance using Airplane Tracker? Contact us by clicking here.